Tarnished: The True Cost of Gold tells the stories of those who mine gold—the lustrous, coveted symbol of wealth. Eleven journalists traveled to 10 countries to tell these stories. Their work combines first-rate reporting, vivid imagery and video, previously published by the Pulitzer Center, an innovative non-profit that supports international journalism. In Chapter Four, Jacob Kushner investigates the future of mining in Haiti, a land ravaged by an earthquake in 2010. Gold remains its hidden treasure, one of the country’s few unexploited natural resources. Kushner asks where the wealth will go when—and if—tons of precious metals are unearthed. (A version of this chapter was originally published by Guernica Magazine).Download the eBook for iPad, iBooks for Mac or Kindle. Perhaps no African people is more optimistic about the potential of Chinese investment than that of the Democratic Republic of Congo, a nation rich in natural resources but poor in nearly every other respect. In this article for The American Interest magazine, Jacob Kushner argues the United States should re-think its approach to diplomacy—a sphere in which China is uncharacteristically out-maneuvering the United States in Africa in several important ways. Read the full article as it appeared in The American Interest. 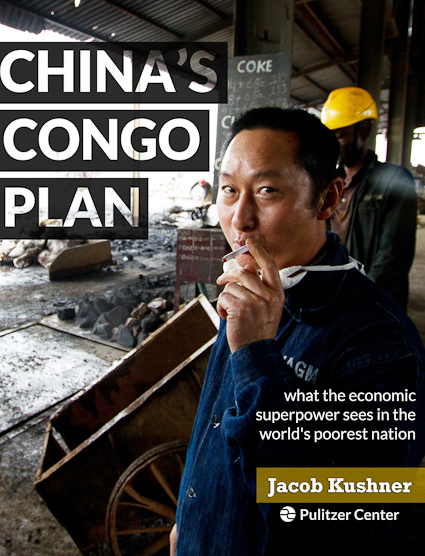 Jacob Kushner’s eBook, China’s Congo Plan, is available through iTunes and Amazon. What does China see in the world’s poorest nation? An opportunity for big business. Congo is known for poverty and conflict, but it is home to an enormous wealth of buried minerals such as copper, whose value is rising on the world market. Already, tens of thousands of Chinese men and women have left their families behind to live in Africa to dig and process ore.
Now, two Chinese state-owned companies are opening the biggest mine Congo has ever seen. In exchange, they’re spending billions of dollars to build new roads and modernize Congo’s infrastructure. 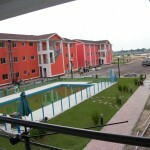 But will Chinese mines and roads help transform Congo in a way Western aid and business has not? Or will Chinese businessmen and Congolese officials get rich while the people continue to live in poverty? 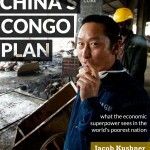 In “China’s Congo Plan”, Jacob Kushner takes us street-side to a grand, Chinese-constructed boulevard in Congo’s capital Kinshasa, to a mountain range where Congolese men, women and children dig for minerals with picks and shovels, and to a factory where Chinese immigrants melt aqua-blue rocks into molten copper lava. Two years after China overtook the United States as Africa’s largest trading partner, Kushner brings us inside the world of China’s rise in the continent. Kushner’s reporting was supported by the Pulitzer Center on Crisis Reporting, and his research was advised by faculty at the Columbia University Graduate School of Journalism. “China’s Congo Plan” was awarded the Grand Prize in the Atavist Digital Storymakers Award for Graduate Longform, sponsored by the Pearson Foundation. ‘Artisanal’ mining is now the country’s leading profession — attracting adults and children alike. Chinese investment is driving its growth. KOLWEZI, Congo — Patrick Bwana strains his body as he thrusts a full-sized shovel into a patch of rocky ground. He is 12 years old. He looks 9. He speaks with his eyes fixed on the ground. “I used to go to school, but my father died, and no one paid for my studies anymore,” he says. Bwana works from around 6 in the morning to about 3 in the afternoon, lugging around bags of rock that seem to weigh as much as he does. He says he can earn $5,000 francs a day doing this. That’s about $5. He hopes he can save enough to pay his own school fees, and return to school. 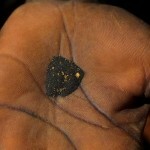 Bwana is one of tens of thousands of child laborers estimated to work in Congo’s mineral sector. Most take to the work out of necessity, to help their parents earn enough to feed their family. 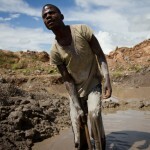 Child labor is illegal in the Congo, as is much of the artisanal mining that takes place in and around Kolwezi on mineral reserves owned or leased by foreign or Congolese companies. Read the full story at GlobalPost or NPR, or at the Pulitzer Center on Crisis Reporting, which provided funding for the project. In Africa’s fastest-growing city, a new haven for Congo’s wealthy burdens some of its poor. KINSHASA, Congo — On one side of the water, hand-carved wooden canoes navigate the marshy canals of a crowded fishing village. Unpainted cement houses line muddy dirt streets where women sit at stands, selling the day’s catch. On the other side, where the fishermen used to cast their nets, a posh private city is being raised from the bottom of the Congo River. Pumping millions of cubic meters of sand, the British hedge fund Hawkwood Properties is developing 1600 acres of water to become a tranquil residential haven complete with swimming pools, schools, grocery stores and a sports complex. A more striking portrayal of income disparity in Congo than Kinshasa’s Cite du Pecheur (Fisherman’s City) and the upcoming La Cite du Fleuve, (City of the River), would be difficult to come by. But Hawkwood’s private development is a logical progression of life in Africa’s fastest-growing city. See the full story and video at GlobalPost. This story was supported by a grant from the Pulitzer Center on Crisis Reporting. Riches beckon from beneath Haiti’s hills, and mining companies are hoping to lock in huge tax breaks to get at them. Deep in Haiti’s northern mountains, a half-dozen supervisors at a mining exploration site spent their days playing dominoes at a folding table next to a helicopter pad. 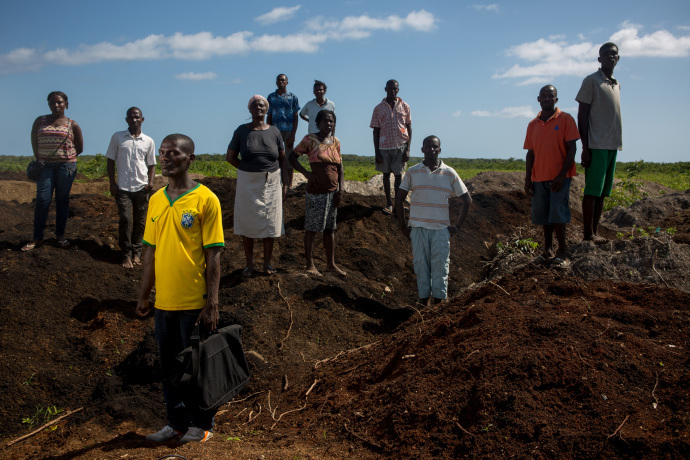 For weeks they waited in La Miel, off a dirt road deep in the countryside, for Haiti’s government to give them the go-ahead to search for the gold they believe is buried in the hills around them. Read the full story as it appeared at Guernica.